Ichthyofauna of Lake Baikal and its basin comprises 67 species and subspecies including 6 naturalized ones. Within the bounds of the lake 57 species and subspecies are registered. Out of this number 34 are endemic golomyanka-goby fishes (Cottoidei) (Table) [The freshwater fish atlas…, 2003; Fishes of…, 2007; Fishes of the Mongolian…, 1983; Sideleva, 2003]. A certain conventionality in the assessment of the fish population composition according to species and subspecies should be highlighted. In terms of biodiversity such accounting is to an extent justified, but such characterization is insufficient for the assessment of ecosystem’s operation. For instance, omul which occupies a 350-meter water column comprises 3 morphoecological fish groups with various morphological diagnoses, behavior, rates of growth, deposition of fat and breeding grounds. The same can be noted in the case of cisco (3 morphogroups) and black and white graylings. These are young “endemic” forms. Their age is within the limits of the Holocene, but they are new stable structural-functional formations “in the bioenergetic sense equivalent” to species [Reshetnikov, 1980]. With them considered the total fish composition of the basin increases to 71, and 61 in Lake Baikal. The results of immigration of various fish species in Lake Baikal for naturalization carried out in the 20th century testify to the fact that zones of life in the lake and its food supplies are quite rigidly fixed. Out of 33 species and intraspecific forms tested for immigration only the Amur carp, catfish, sleeper and Caspian bream survived in the lake (mostly in its “peripheries”), while peled survived in the lakes of the watershed basin. Rejection of non-Baikal fish species by Lake Baikal was also reflected in the analysis of the causes of “unmixing” of the Baikal fauna with the life around the lake. According to current concepts [Vereshchagin, 1935; Kozhov, 1962; Taliev, 1955, etc. ], Baikal’s ichthyofauna is divided into two ecologically and genetically diverse complexes: European-Siberian and native Baikal ones. In the recent years the “neoendemics” or new young endemic offshoots of widely spread species have been registered [Timoshkin, 1995]. The faunal classification by G.V. Nikol’sky (1953, 1980) is usually used in the course of analysis of fish distribution according to their biotope [Kozhov, 1960]. Despite some shortcomings [Sychevskaya, 1983] this classification is rather appropriate for reflecting the ecological specificities of the faunal complexes in the conditions of one and the same water body. It enables to observe their rigid differentiation in Lake Baikal [Mamontov, 1977; Sorokin, Sorokina, 1988]. 1. System of lakes, sors, bays and near-delta shallow waters of Lake Baikal. Inhabits the boreal plain complex – limnophiles of the coastal-sor fish group (roach, perch, pike, orfe, crucian carp, etc.) occupy the entire system of interconnected lakes, bays and sors of Lake Baikal to a depth of 10-50 m. Sturgeon is the only exception for particular distribution to depths of 180 m. In Baikal it occupies an area of limnorheophiles. The lakes near Lake Baikal (Kotokel’, Dukhovoe, and Barmashovoe) can also be included here. Their ichthyofauna composition and productivity are dependent on a degree of their connection with Lake Baikal. The highest productivity occurs with the maximum, but not complete, disjunction with Baikal. Lake Kotokel’, one of the most productive lakes, is inhabited by 15 fish species (catfish, carp, bream, roach-bream hybrid, roach, dace, nerfling, crucian carp, river perch, sand sculpin, and stoneloach). Lake Barmashovoe, previously uninhabited by fish, is now inhabited by river perch, roach, dace, and pike, which migrated there from sor-lake Arangatuy during water level increase on Lake Baikal [Fishes of…, 2007]. 2. Coastal zone of open Baikal- the boreal piedmont complex - limnorheophiles of littoral and partially sublittoral areas (taimen, grayling, lenok, minnow, loach, etc.) occupy Baikal coastal open waters to a depth of 20-70 m, rarely up to 100 m.
3. Abyssal zone. Arctic freshwater complex (cisco, lawyer, omul) populate the slope and pelagic zone to a depth of up to 350 m — the Baikal autochthonous complex. It includes endemic Baikal scorpion fish: bullheads, deep dwelling Baikal sculpins and Baikal oilfish (golomyanka) that took the entire water column of the lake with the greatest diversity of benthic forms at depths of 600-700 m.
Due to the fact of high capacity of proper Baikal conditions qualitative changes in fish caused quantitative expression: higher environmental capacity corresponds to the density of endemic fish population (about 65 % of the fish biomass of the lake). This complex becomes the main one ensuring successful existence of the first three, including the Baikal seal, owing to fish diet [Sideleva, 2003]. A complex set of species of different faunal assemblages and goby fish has led to a number of features in the structure of the fish community of Lake Baikal. According to the nature of habitat and behavior of species the Baikal communities include features of ocean ecotone communities, and according to the type of population dynamics (explosive nature) and to the composition they correspond to the Siberian biocoenoses [Mamontov, 1977]. By the abundance of fish Baikal belongs to the golomyanka-goby fish type of a water body [Koryakov, 1972]. Success in assimilating the biotic and abiotic environment of Baikal by fish species of this complex lies primarily in their original biological qualities – absence of a swim bladder (and therefore availability to the deep-dwelling habitation), increased fertility, protection of spawn, occupation of all zones for spawning within the open Baikal, and finally, removal of the embryonic development of eggs in golomyankas in pelagic zone - in the body of a female, functioning as spawning substrate [Chernyaev, 1973, 1974]. These issues are important in theoretical and practical investigations of fish fauna and its rational use. Increase in the number of individuals in a behavior homogeneous group leads to their increased consumption, and in the future to an increase in the population, group or other biological heterogeneity, reducing predation pressure on certain groups. This developmental pattern became widespread among Baikal slow-moving benthic organisms. The development of variability of morphological characters, color and behavior accelerated their speciation. Among 34 endemics, 28 (82.5 %) are typically benthic forms. Necessity of multivariancy of individuals in a population of the pelagic fish group weakens due to the formation of a high population size of the few species with small size of their body. This vector of species evolution became possible on the basis of the pelagic larval-fry stage which contributed to dispersal and acquisition of the entire littoral zone for spawning. They include sand sculpin and yellowfin Baikal sculpin. These species occupied biotopes from the shore area to a depth of 500-700 m. Further oecizing of Lake Baikal was feasible due to vivaparity of Baikal oilfish [Taliev, 1955; Chernyaev, 1973]. As a result it became possible to disseminate fry within the confines of general currents facilitating its dispersal in the water area and to settle practically the entire water column. By the number and rate of reproduction, pelagic species prevail over other species so much that they are used in the diet of Baikal seals (nerpa) and almost all the fish of the lake, including cannibalism of gobies themselves on their own fry. This leads to the populating of Lake Baikal by fish of the common Siberian complex and the entire Lake Baikal’s ecosystem stability in time. River and lake systems of the basin reflect the interchange of mountain and plain spaces. They are inhabited by interpenetrating species of the boreal piedmont, boreal plain and Arctic freshwater complex of the Arctic province. The contemporary Arctic ichthyofauna is a derivate of a more thermophilic Neogen Euro-Siberian ichthyofauna that existed in the temperate zone of Eurasia. Its modern distribution is defined by a sharp differentiation of landscape and drainage system following the Alpine orogeny at the boundary of the Pliocene and the Pleistocene accompanied by a more pronounced delimitations of climatic zones [Sychevskaya, 1983]. Water bodies of the watershed area are inhabited by 33 species, including 27 species in the Selenga river (20 local species, two Baikal endemics, six natiralized species and dwarf Altai osman that has recently penetrated the Selenga river basin), and nine species in Lake Khovsgol, including the endemic Kosogol grayling and naturalized Baikal omul. The endemic Baikal-Lena grayling was detected in the fluviolacustrine system of northern mountain streams, while in the Upper Kichera lakes an isolated population of coastal-pelagic omul and homotypical ichthyocenoses formed by the Baikal-Lena grayling and Arctic char (Verkhneuyakchinskie lakes) (Table) [Fishes of Lake…, 2007]. 4. Lower and upper courses of the Selenga river – packings and spawning migrations of omul, sturgeon and Siberian whitefish, habitation and spawning of Siberian whitefish, graylings, lenok, burbot, taimen, dace, roach, pike, etc. 5. 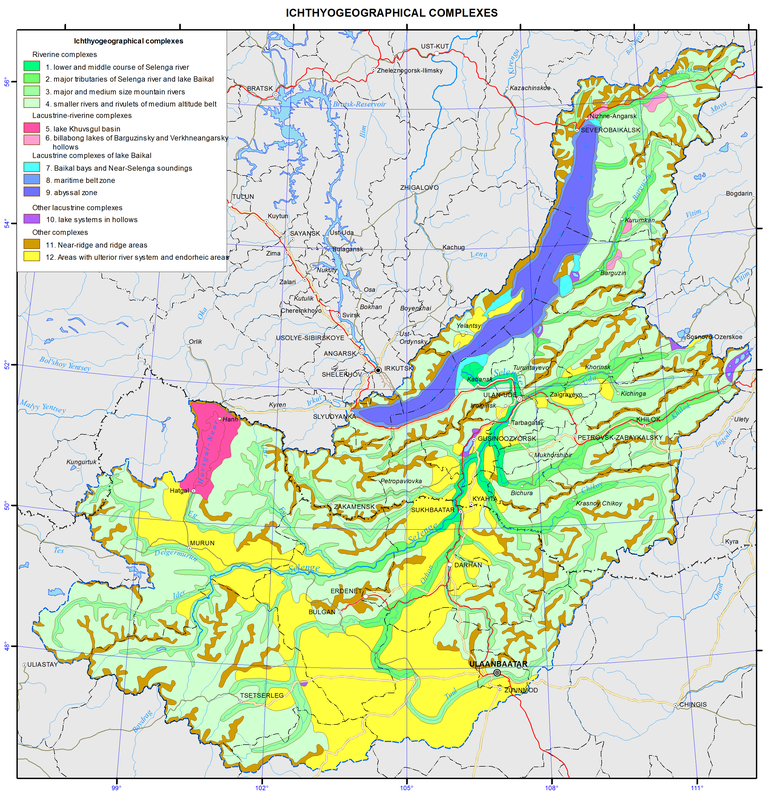 Large tributaries of the Selenga river and of Lake Baikal – packings and migration of omul, lenok, grayling, taimen, burbot, dace, carp, bream, dwarf osman, etc. 6. Large and medium mountain streams and drainage high altitude lakes – habitation of grayling, lenok, taimen, common minnow, spined loach, Siberian stone loach, dace, perch, roach and pike. The Upper Kichera lakes, Kulinda and Verkhnekicherskoe – habitation of omul, pike, burbot, Siberian stone loach, grayling, sand sculpin, stone sculpin, and common minnow. Svetlinskoe lake – habitation of three species: Arctic char, common minnow and Siberian stone loach. Lake Frolikha – 11 species, including lenok, Arctic char, grayling, pike, roach, perch, burbot, lake minnow and common minnow, spined loach, sand sculpin and stone sculpin. The Verkhneyakchinskie lakes (the Yakchai river) – habitation of Arctic char (small and dwarf) in one lake and one species of Baikal-Lena grayling in the other. 7. Small streams and creeks of the medium-altitude mountain belt – possible habitation of minnows and temporary entries of grayling for spawning. 8. Lake system of the hollows – water bodies diversified in size, hydroclimatic conditions and fish composition. A cluster analysis of interrelationship of fish species was carried out in order to characterize Transbaikalian ichthyocenoses [Biodiversity…, 1999]. Two fish complexes determine the ichthyocenoses structure of the lakes: 1 – roach, perch and pike; 2 – lenok and grayling. Other fish species have subdominant value and build up the distinctness of communities. The first complex is connected with the lake limnogenesis processes, while the second – with the tectonic processes, specific for the Baikal type intermontane hollows. The Eravna lakes: in the Shchuchye lake (one of the Eravna lakes) there are peled, perch, roach and pike. Fishes from this lake underwent a thorough study of their productional characteristics. The results were used for the analysis of fishes in the water bodies of the Eravna-Kharginsk lake system. The Gusino-Ubukinskaya group, small water bodies (roach-perch lake Shchuch’e, crucian carp lakes Kamyshovoe, Krugloe, Chernoe, and perch-dace Abramovskoe lake). The total of 10 species registered: Amur sleeper, sand sculpin, spined loach, perch, burbot, lake minnow, crucian carp, dace, roach, peled and omul. Lake Gusinoe is the largest one. It is inhabited by 22 species: taimen, lenok, carp, bream, Amur catfish and Amur sleeper and farmed omul and peled. The Ivano-Arakhlei lakes (Arakhlei, Shaksha, Undugun, and Irgen) are inhabited by 16 species. Mostly they are pike, roach, dace, crucian carp, European cisco, peled and omul. 9. Meander lakes of the Verkhneangarskaya and Barguzinskaya hollows. The major lake complexes host 15 to 20 species, such as roach, perch, pike, nerfling, crucian carp, tench, carp, catfish, bream and others. There are about 7000 lakes in the Upper Angara and Kichera basins. The largest one is the eutrophic Irkana lake hosting nine species, such as roach, perch, pike, crucian carp, dace, nerfling, lake minnow, burbot and tench. The Barguzin basin lakes (4918 lakes) are inhabited by 19 fish species. In the upper course (mesotrophic) lakes there are taimen, lenok, grayling, common minnow, burbot, sand sculpin, Siberian spined loach and stoneloach. In the middle course (eutrophic) lakes there are pike, roach, perch, nerfling, crucian carp, bream, burbot, catfish, tench, carp, lake minnow, etc. In the lower course eutrophic lakes there are pike, roach, perch, dace, nerfling, crucian carp, catfish and lake minnow. 10. Ichthyocenosis of Lake Khovsgol. Nine species. The species composition has been forming since the post-glacial period. In 1957 the Baikal omul was introduced. Nowadays the water body is characterized as the lenok-grayling type of water bodies [Tugarina, 2002; Fishes…, 1983]. The majority of fishes inhabit coastal areas (grayling dwells at depths down to 25 meters, burbot – down to 30 meters) with the highest concentration in the bay and the mouth of the Khankh-Gol river. In 1957 10 million Baikal omul eggs were additionally incubated in the mouth of the Ikh- Khankh-Gol river by Professor A. Dashidorzhi of the Mongolian University. The first omul was detected in the mouth of the Ikh-Khankh-Gol river in 1971. Beyond the bay area omul has not yet been detected. Lenok inhabits the depths of 7 to 12 meters. Habitation limits in the open littoral of the western shore are confined to the 25-30 meter isobaths. The generative river form of grayling inhabits the area from the edge of water to the 25-30 meter isobaths while the generative lake form reaches down to the 80-100 meter isobaths. The roach habitation zone is limited to depths of down to 15 meters. Minnow inhabits the shore edge down to the depth of 1-1.5 meters while stoneloach – down to 1-1.3 meters. These are usually backwaters. Siberian spine loach inhabits the areas with sand and slimy ground down to the depths of 3 to 5 meters. Perch is common in the littoral at the depths down to 10-15 meters. Burbot is common everywhere within the depths of down to 40 and rarely 70 meters. All deep tributaries of Lake Khovsgol are mainly used as spawning grounds of lenok, grayling, burbot, etc. The meander lakes of the Ikh-Khoroo-Gol and Egiin-Gol rivers as well as the Ongolik Bay are the spawning grounds of perch, roach and minnow. 11. Near water-divide and water-divide areas. Small fishless lakes. 12. Territories with ulterior river net and closed drainage areas are located beyond the limits of the ichthyogeographic complexes. The freshwater fish atlas of Russia : 2 vols. (2003). / ed. Yu.S. Reshetnikov, Moscow: Nauka, Vol. 1 379 p., vol 2. 253 p.
Korsunov, V.M., Pronin, N.M., Gonchikov, G.G. et al. (1999). Biodiversity of the Baikal Siberia, Novosibirsk: Nauka, 350 p.
Vereshchagin, G.Yu. (1935). The two typobiological complexes of Baikal. Trudy Limnologicheskoi stantsii, vol. 6., pp. 199-212. Kozhov, M.M. (1962). Biology of Lake Baikal, Moscow: Izd-vo AN SSSR, 315 p.
Koryakov, E.A. (1972). The pelagic gobies of Baikal, Moscow: Nauka, 1972, 155 p.
Mamontov, A.M. (1977). Ichthyocenoses, their dynamics and production. Limnology of the coastal-sor zone of Baikal, ed. by corr. member of the Academy of Sciences of the USSR N.A. Florensov. Novosibirsk: Nauka, pp. 263-288. Nikol’skiy, G.V. (1953). On the biological specifics of the faunal complexes and the significance of their analysis for zoogeography, Moscow-Leningrad, pp. 65-76. .
Nikol’skiy, G.V. (1980). The species structure and tendencies of fish variability, Moscow: Pishchevaya promyshlennost’, 183 p.
Pronin, N.M., Matveev, A.M., Samusenok, V.P. et al., Fishes of Lake Baikal and its basin, Ulan-Ude: Izd-vo BNTs SO RAN, 2007, 284 p.
Reshetnikov Yu.S. (1983). The ecology and classification of the Coregonidae, Moscow: Nauka, 301 p.
Fishes of the Mongolian Peoples’ Republic. (1983). Moscow: Nauka, 277 p.
Sideleva, V.G. (2003). The endemic fish of Lake Baikal, Backhuys Publishers, Leiden, 270 p.
Sorokin, V.N., Sorokina, A.A., (1988). Biology of the commercial fishes of Baikal, Novosibirsk: Nauka, 214 p.
Sychevskaya, E.K. (1983). History of formation of Mongolia’s ichthyofauna and problem of faunal complexes, Fishes of the Mongolian Peoples’ Republic, Moscow: Nauka, pp. 225-249. Taliev, D.N. (1955). Bullheads (Cottoidei) of Baikal, Moscow-Leningrad: Izd-vo AN SSSR, 602 p.
Timoshkin, O.A. (1995). 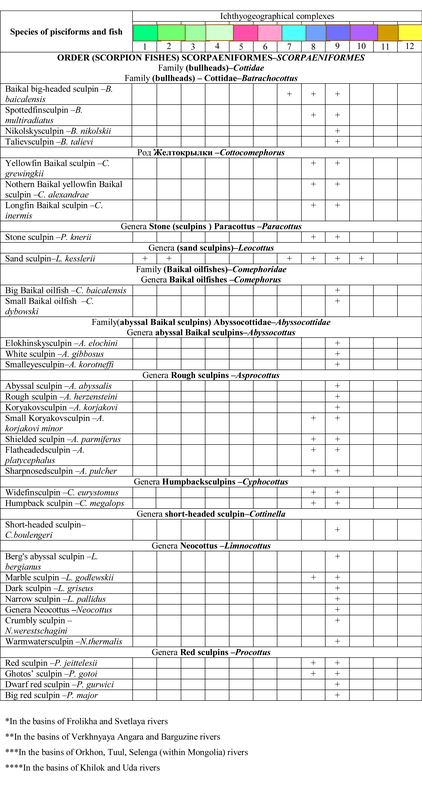 Biodiversity of Baikal faunas: contemporary level of knowledge survey and study prospects, Atlas and field guide of Baikal pelagobionts, Novosibirsk: Nauka. Sib. Otd-nie, pp. 25-52. Tugarina, P. Ya. (2002). Fish ecology of Lake Khubsugul and their fishery potential, Irkutsk: Izd-vo Irkutskogo gos. un-ta, 209 p.
Chernyaev, Zh.A. (1973). On the genesis of the Baikal bullheads (Cottoidei), Zool. zhurn., vol. 52, #3, pp. 452-453, . Chernyaev, Zh.A. (1974). The Morphoecological peculiarities of reproduction and development of big Baikal oilfish Comephorus baicalensis (Pallas), Vopr. ikhtiologii, 14(6), p. 990-1003.